"A quick and easy meal that kids love! My mom made them for me when I was a kid, now I make them for my daughter." Make a slit down the middle of one end of each hot dog; this will be the legs. At the other end, make a small slit each side; these will be the arms. Bring a saucepan of water to a boil, and add the hot dogs. Boil for about 5 minutes until the slits open up. Place slices of cheese onto slices of bread. Set the hot dog men on top. Use ketchup and mustard to make a face, hair and clothes or buttons. 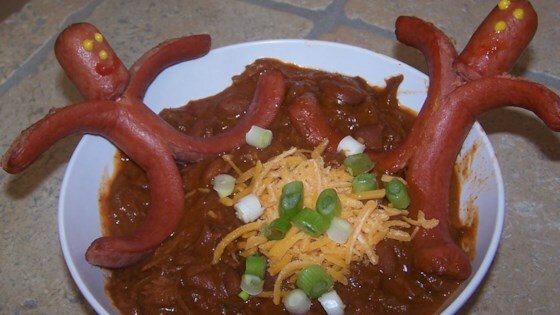 Treat yourself to some chili dog nostalgia with this terrific topper! Very cute recipe! I also make an octopus out of hot dogs and sit it on "blue"(just a drop of food coloring) mac and cheese. The kids LOVE this stuff! Cute idea. Not enough of us play with our food! Thank you. Awesome idea, lots of smiles all around! TOOOOOOOO CUTE!!!!!! So easy and a big hit with my daughter!